Explanations for each of the test areas and sample questions. A single full-length practice test, with the same number of questions as the FxAT Level 8 exam. Progress chart to track your child’s efforts. Steps for improving your child’s scores. The object of this practice test is to familiarize your child with sample questions they will face on test day, how the tests are formatted, the symbols used and the number of questions in in each test area. However, since this practice test has not been standardized with Riverside Publishing and the actual CogAT test, a valid CogAT test score cannot be concluded from their results on these practice tests. eBooks are downloadable on both PCs and Mac Products and are viewable for 60 days. eBooks are not printable or transferable to other devices. eBook downloads will require you to download Adobe Digital Editions and enter a username and password. Step-by-step instructions and download links will follow your purchase in a separate e-mail. q FxAT® and CogAT® are registered trademarks of Houghton Mifflin Company. 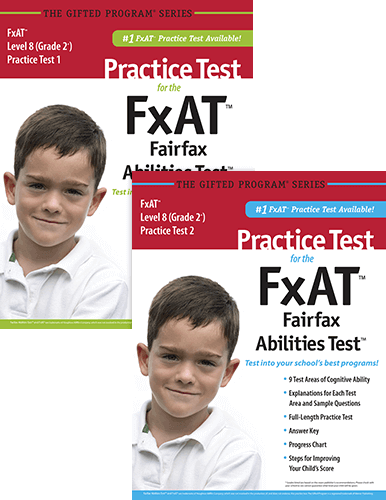 The Fairfax Abilities Test (FxAT) is owned by Houghton Mifflin Company and published by Riverside Publishing, a Houghton Mifflin Company. Neither Houghton Mifflin Company nor Riverside Publishing was involved in the production of, nor endorses, these practice tests. w Grades listed are based on the exam publisher's recommendations. Please check with your school as we cannot guarantee what level your child will be given.